Juliana’s school uses a reading system based on 15-minute reading steps and each student is required to complete 15 steps each week. Every 25 hours of reading = 100 steps and they receive a new folder for their reading logs every 100 steps. In first grade Juliana was the top reader in her class. In first grade they had reader’s workshop which gave them the opportunity to complete 2 steps during school time. In second grade there is no regular in class reading time so the majority of her reading steps were completed outside of school. I have plenty of friends who talk about how much their first and second graders love to read – that’s not Juliana, I wish she did love reading. Occasionally she finds a book that she really enjoys and she willing reads beyond her required time. But primarily she reads because it is required for school and because she is motivated for iPad time. 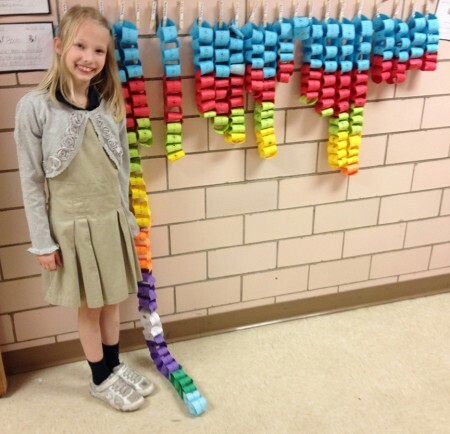 She also has a competitive spirit and at some point in the year we discussed whether or not she could complete 1000 reading steps and she thought that would be really cool. So she started to complain less about the required reading and made an effort to find books that would be more interesting to her. 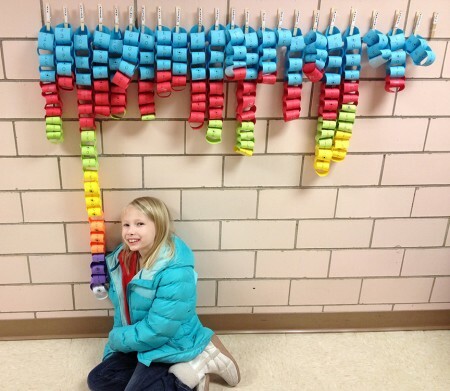 In the hallway outside the second grade classrooms, there is a physical representation of completed reading steps for each homeroom. Here is Juliana in March and more recently. A few weeks ago she realized how close she was to 1000 steps and every day she would excitedly tell us how many steps were remaining to 1000. Last Friday she had an in-service day for school and she spent lots of time reading and by Sunday evening she had done it. 1000 reading steps and 250 hours of reading since Labor Day (when they started the challenge)! 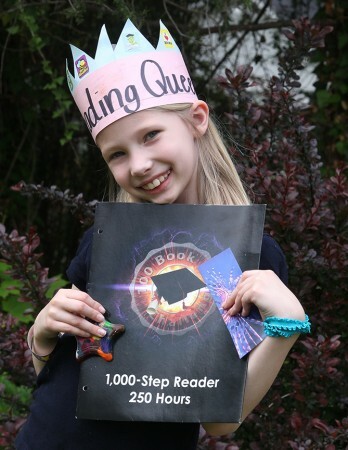 She was thrilled and yesterday she received her 1000 folder and her teacher crowned her the Reading Queen! 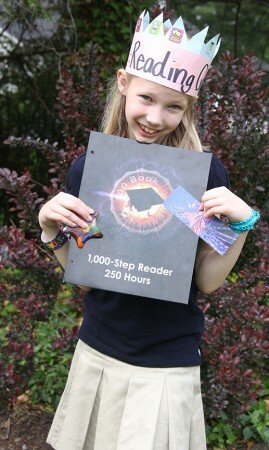 She bounced in the house after school and told me that she is going to read 2000 steps next year; my hope is that all of this reading is convincing her that reading is fun. PPS I love the Queen picture. If I had one it would go right on my refrigerator!!! !